When I asked Sara and Alex what was important to them in their relationship, they immediately both jumped to say their pets. Their pets were their babies, and their life – for them, that was what was most important. 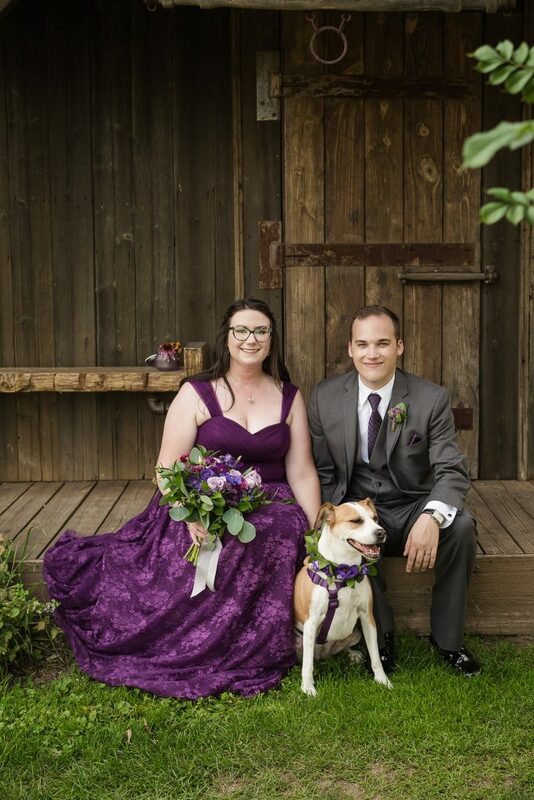 Their goal for the wedding was to incorporate their pets as part of the day, in as many elements as they could. For me, I took that and ran with it. 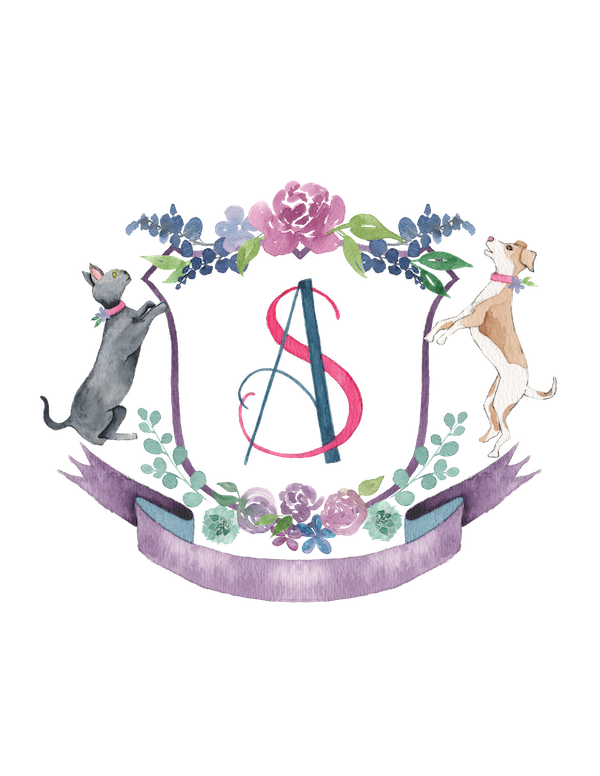 From a crest with their dog and cat on it at the top of their wedding invitation, to the signature drinks being named for each fur baby, to their sweet dog in an amazing floral wreath making a cameo appearance, Sara and Alex’s big day at Misty Farm is sure to give you lots of amazing pets wedding ideas. 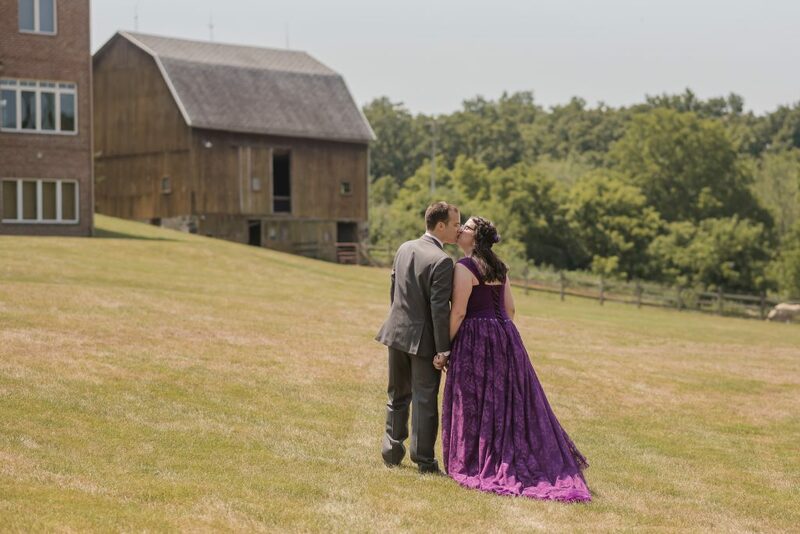 At our initial consultation, I also asked Sara and Alex what their day was going to look and feel like, and they said they wanted a really laid-back vibe: no seating plan for their guests at the reception and making use of all the open space at the farm. 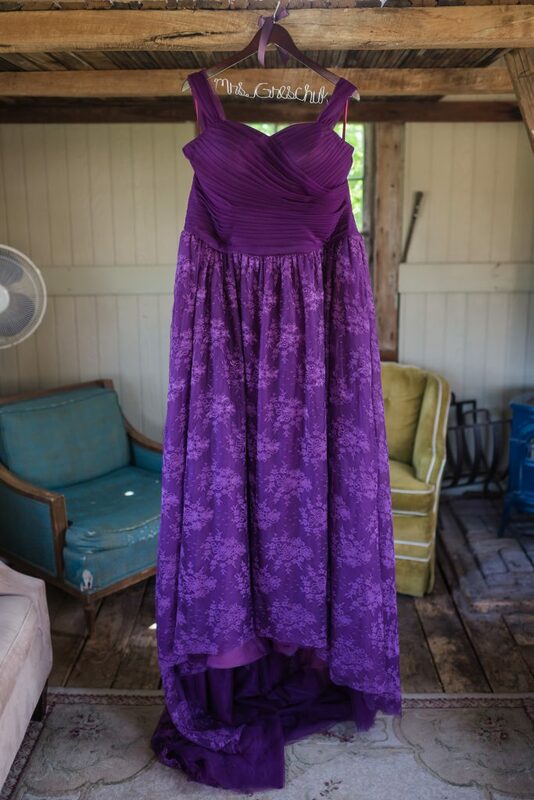 Oh, and everything was going to be purple – right down to Sara’s dress. She whipped out a picture on her phone right then and there, and I freaked out a little, because Alex was sitting with us too. “Oh don’t worry – he obviously knows, it’s fine.” These two were great – they had been together for a really, really long time and it was clear that they were already a family and knew each other inside and out. 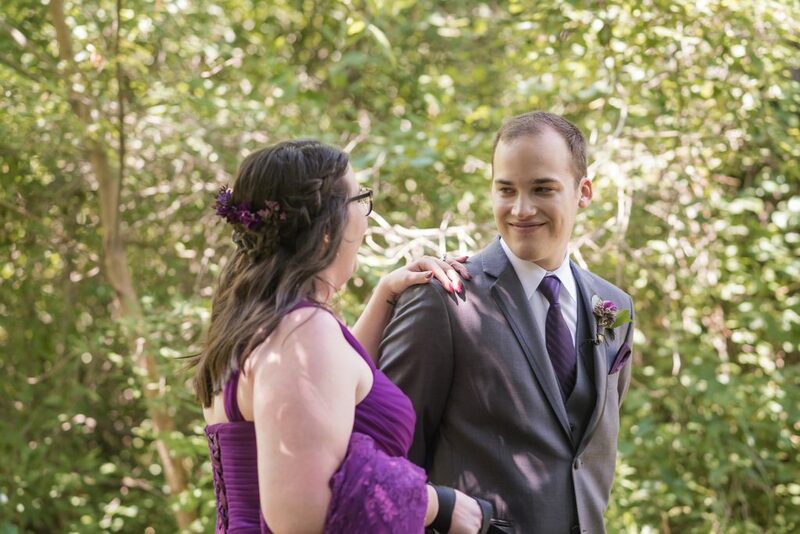 To me, it seemed as if their wedding was a long time coming, and they were both so excited the day was happening! 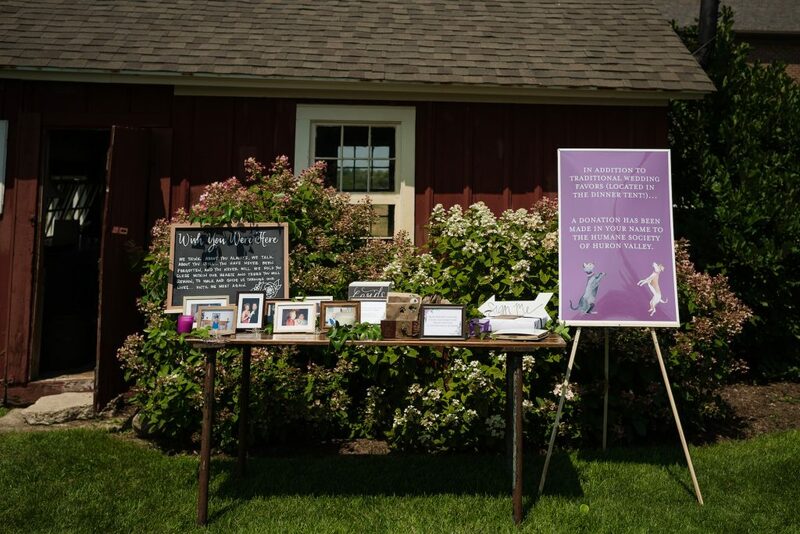 Here are some great pets wedding ideas I used for Sara and Alex’s design. If you’re taking engagement portraits, check with your photographer about incorporating your pup (or cat or goldfish or bird, you know – whatever you’re into) into at least a portion of your shoot. 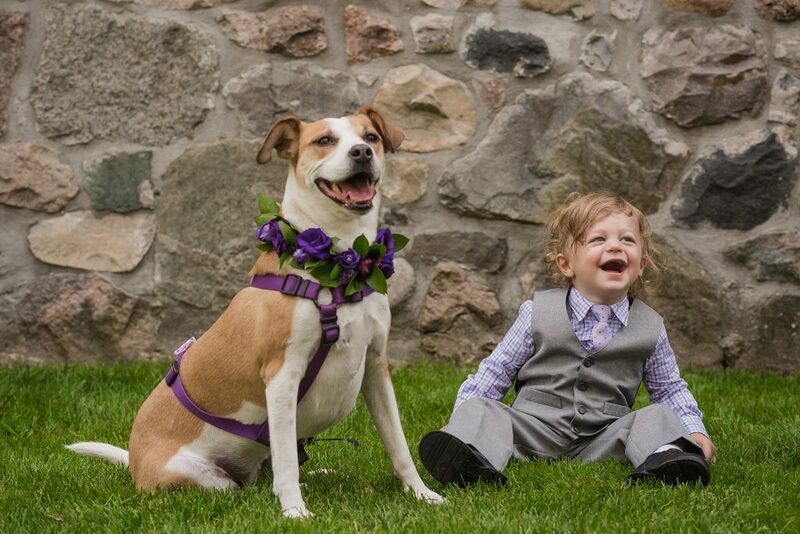 Chances are good that she’ll allow you to bring Fido along, and you’ll have a great family portrait! 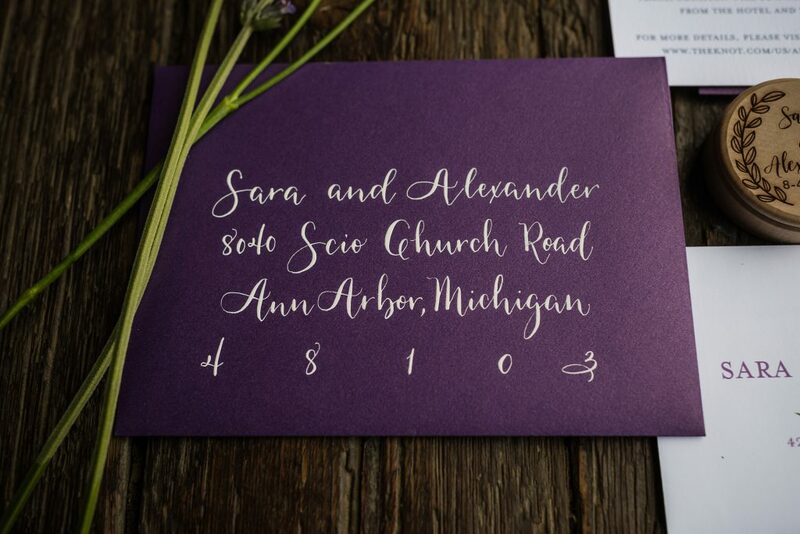 Sara and Alex opted for this, and I incorporated a photo on their Save the Date with their dog, along with lots of watercolor lavender sprigs and brush calligraphy. 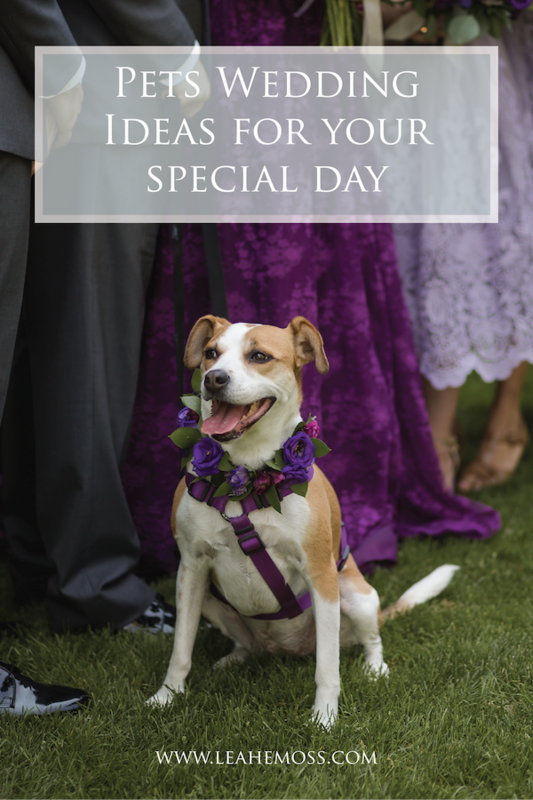 The card was packaged in a pale purple envelope, setting the tone for their purple and pets-centric day. 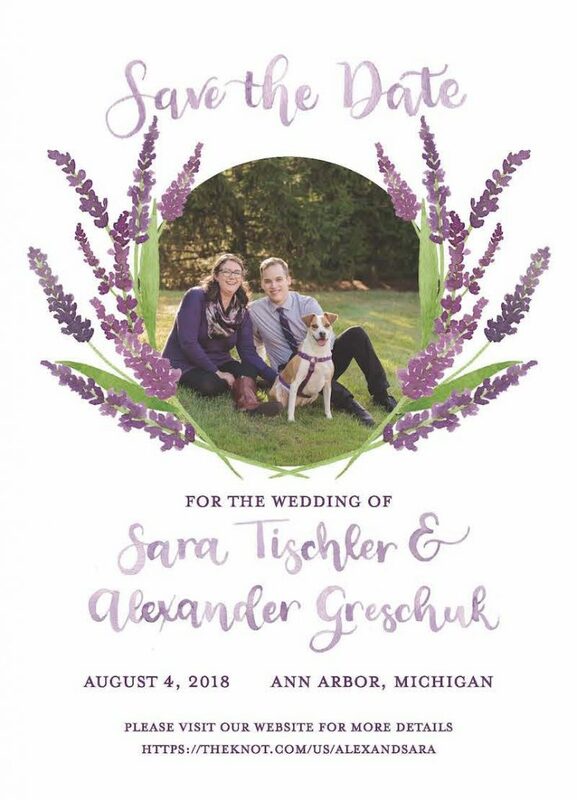 As another pets wedding idea, Sara and Alex’s wedding invitation had a crest. 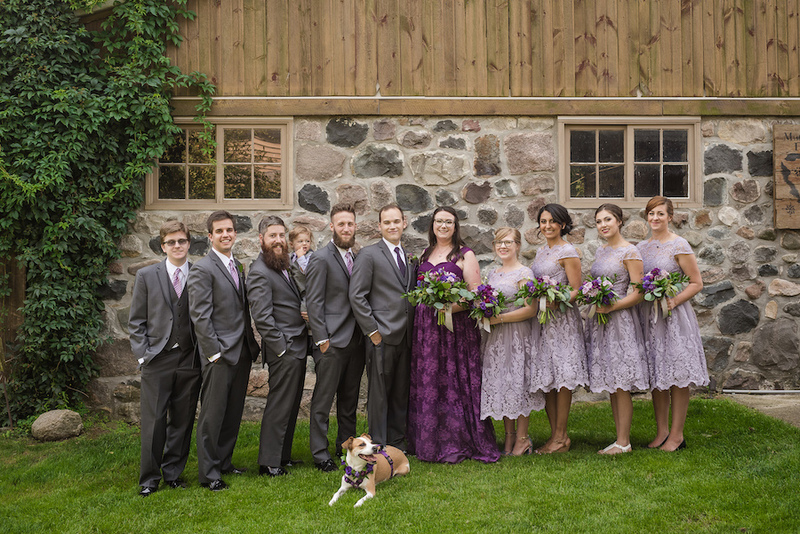 This emblem not only featured their initials and the purple florals representative of the day, but also included their dog and cat as part of the crest design. On the response card, we worded it that “Phoebe and Bu request…”. Anyone who knows this couple knows that Phoebe and Bu are their beloved pets who run the house, so they were the ones requesting a reply. 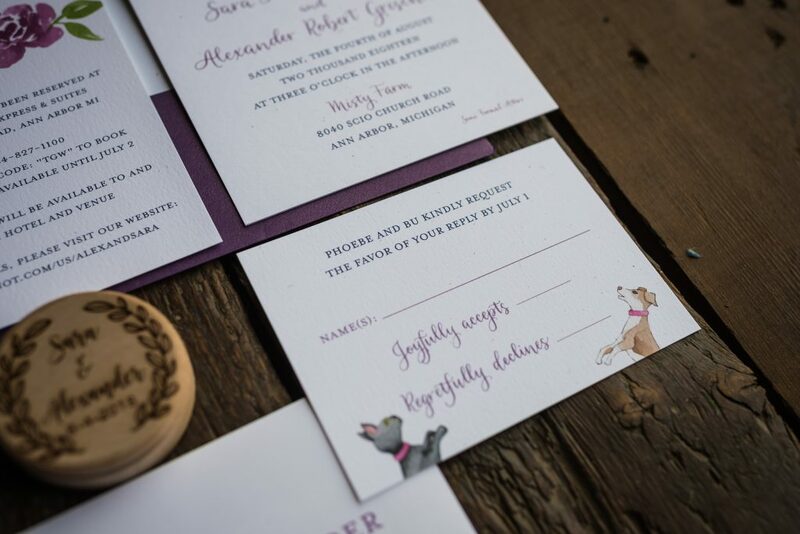 Your wedding invitations should reflect you as a couple – and if that means putting pets on there in some capacity, then great! This crazy dog mom is here to help. 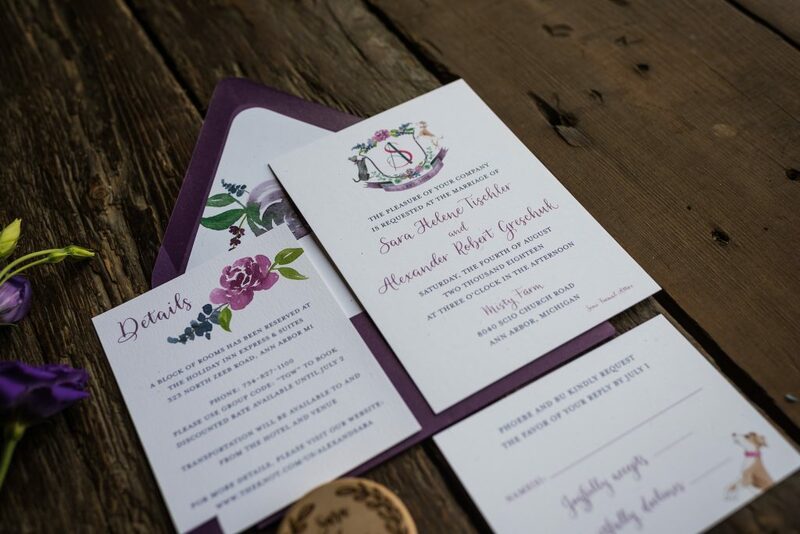 Here are some more close-ups of Sara and Alex’s wedding invitations, which featured a modern calligraphy style, various shades of purple, and a custom watercolor floral envelope liner. 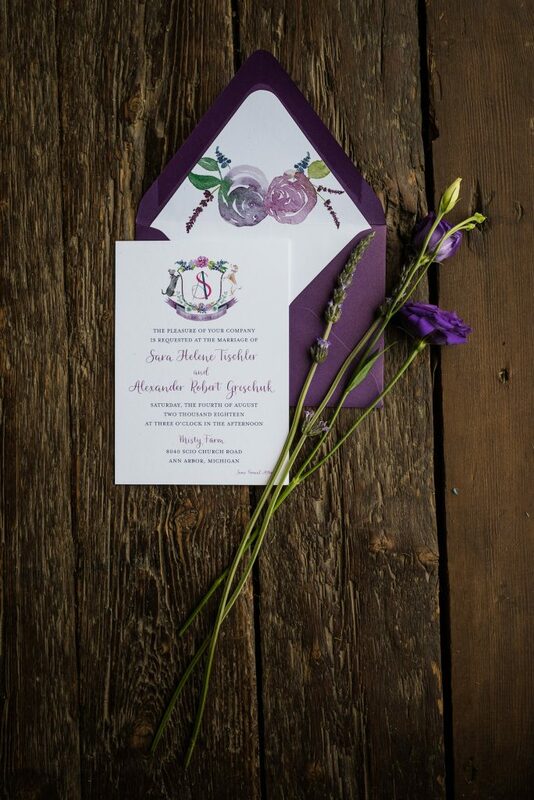 The whole bundle of joy was enclosed in a dark purple envelope with white calligraphy envelope addressing. Such a fun suite to design! Let me start by saying that you have to check on this one if you’re getting ready at a hotel/banquet venue. BUT, if you’re getting ready at a family member’s home, consider having your pet with you while you get your hair and makeup done. 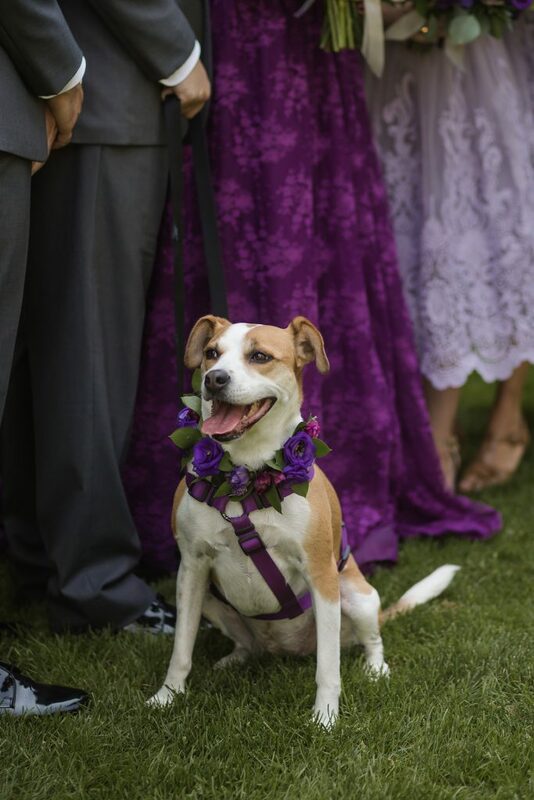 While getting ready, many brides are a bundle of nerves, and pets are always helpful to calm you down! 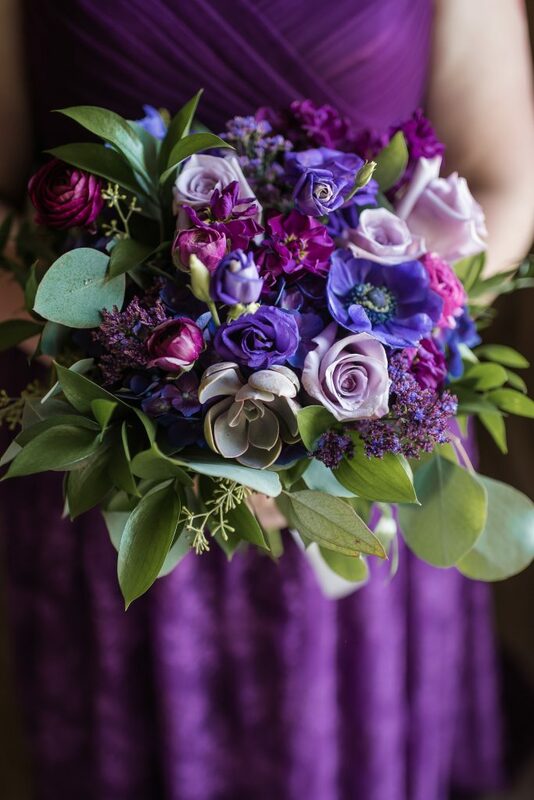 Sara got ready in her gorgeous, statement-making purple gown and had a gorgeous bouquet to match. She looked stunning – and felt like herself! …and watch her steal the show. 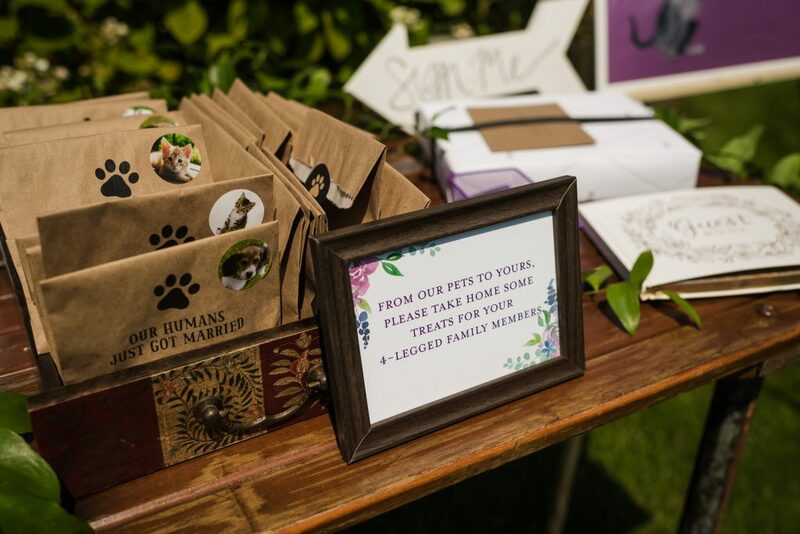 This pets wedding idea is always so cute! It gets even better if your florist makes your pup a custom floral wreath, like Phoebe wore for Sara and Alex’s special day. This way, the pup matched the rest of the decor and other VIPs for the event. How could you showcase your furry pals as part of your decor? 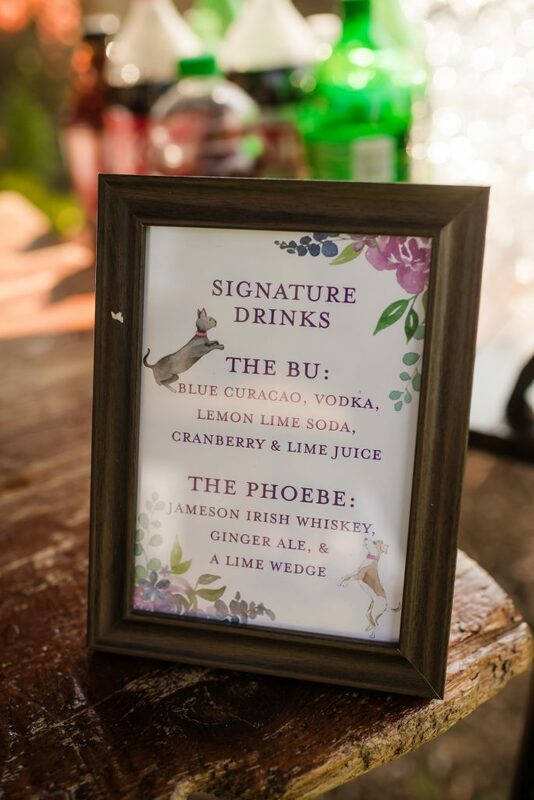 For Sara and Alex, we named the signature drinks after each of their pets, calling them “The Phoebe” and “The Bu,” as opposed to his and hers, or something based on the location. Sara and Alex knew that animal welfare was important to them, so it wasn’t just about aesthetics. 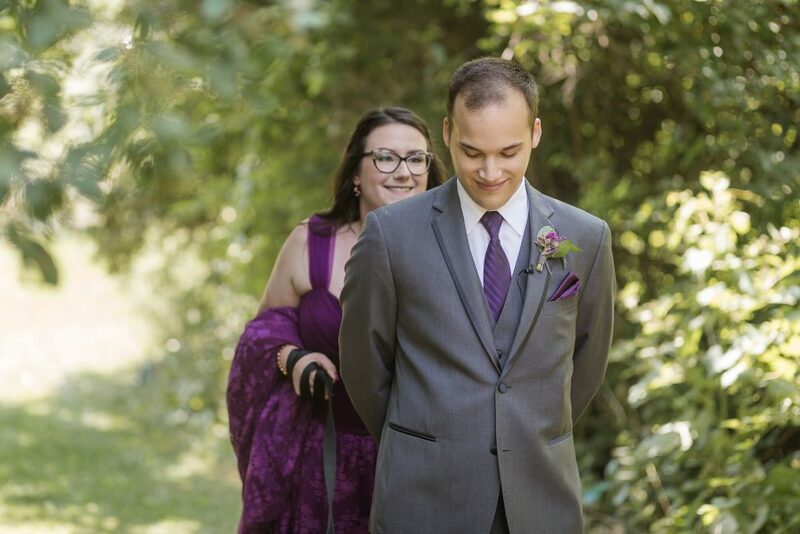 In addition to “normal” favors, this sweet couple made a donation to the Michigan Humane Society in honor of their guests. Plus, they had little treats for guests to take home for their own pets. For all of these elements, the pets were featured as part of the signs, or they were the key focus of a sign’s content. Know what matters to you – and showcase it! 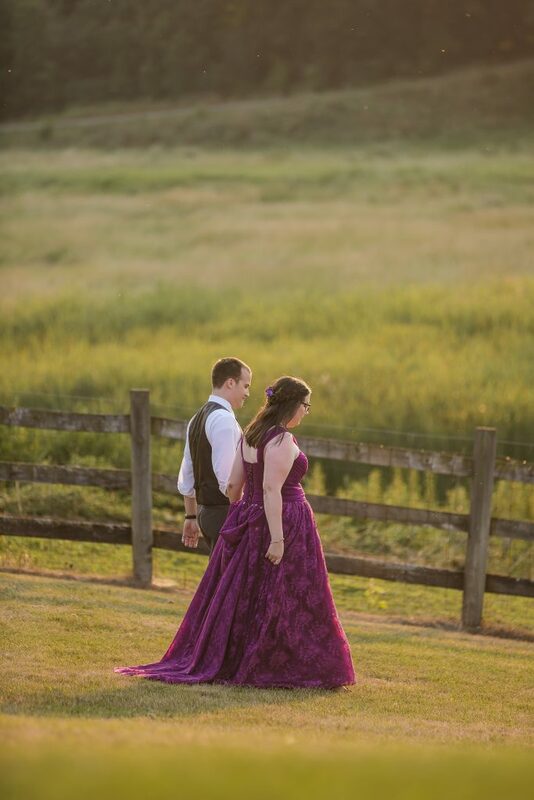 Sara and Alex had such an incredible day! 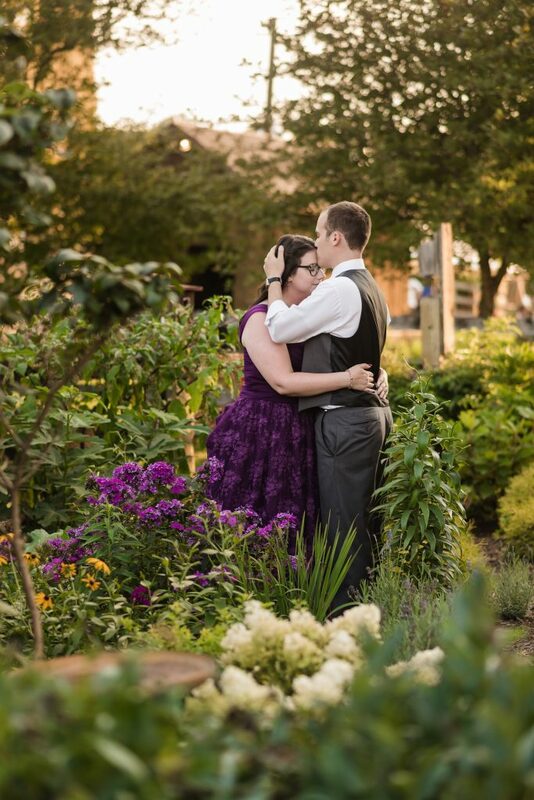 Their whole vibe was just lovely and I feel so fortunate to have clients like this, who have such a clear sense of who they are and what is important to them. Knowing what makes them unique as a family, and what that then means for what should be showcased for their day, is such a gift. 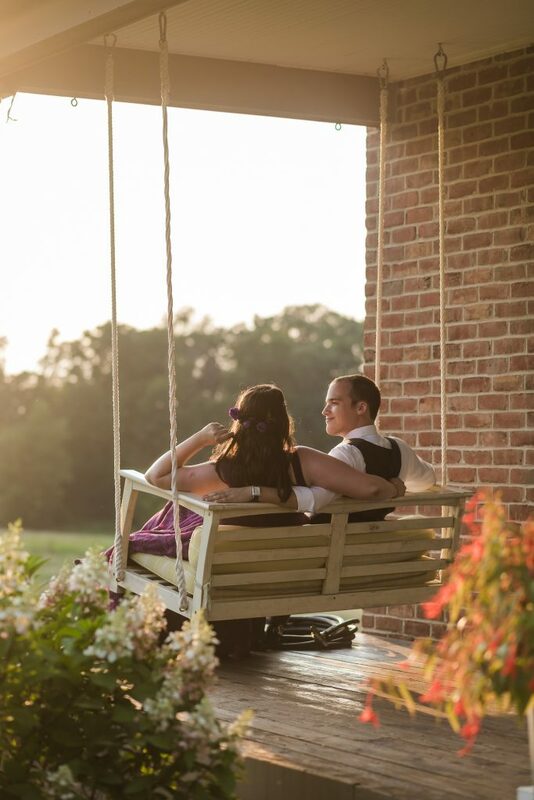 So, Sara and Alex, thanks for the opportunity to work with you both and to help celebrate your love, and your love for your whole family – fur babies included. 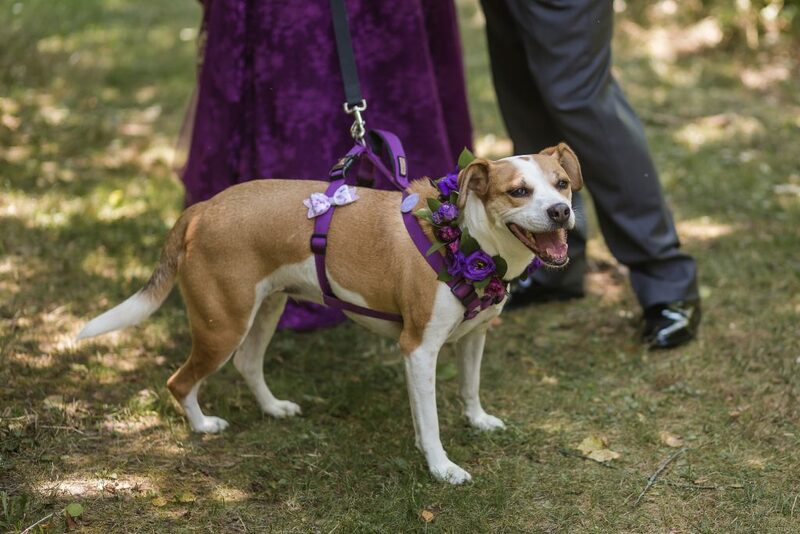 I hope their day has inspired some pet wedding ideas of your own! If I can help bring them to life, reach out! Did you find this helpful? Save this pin for later on Pinterest! © Copyright Leah E. Moss Designs 2019. Theme By Bluchic.